Figure 3.15 A Canadian working class arose in the major urban centres; it was also fashioned in relatively remote resource towns like Port Essington on the northwest coast where Aboriginal, Euro-Canadian, and immigrant labour from Asia and Europe met for the first time. The Canadian working class was emerging well before 1867. By Confederation one could say for the first time that the growth of the working class was now unstoppable. The creation of the Dominion of Canada took place precisely at that moment when widespread industrialization was visibly underway. In 1851, fewer than a quarter of Hamilton, Ontario’s workers laboured in workshops of ten or more employees; by 1871 the share was more than 80%. In less than two decades, Hamilton had been transformed from a market town dominated by commerce into a powerful symbol of heavy industry. Significant and startling though this change was at the time, it was dwarfed by developments in the 1890s. In that decade, Canadian economic growth simultaneously intensified in the older cities and found new fields in which to flourish in the West. The population of Canada in 1901 was 5,371,315; ten years later it was 7,206,643 – an increase of 34%. At the same time, however, the labour force grew from 1,899,000 in 1901 to 2,809,000 in 1911, a phenomenal 50% increase. To put this into some perspective, there were only 3,463,000 people in the Dominion in 1867 — by 1911 there were close to that many working, wage-earning Canadians. The working class were motivated and shaped by different factors in the various regions of the country, although common themes were quick to arise. A middle-aged factory worker in 1870 would likely remember very clearly working in settings where having a half-dozen other employees felt crowded. In the 1860s, working spaces were designed for small teams of mostly manual labourers and artisans. That was about to change. Industrializing employers were finding their way in a new kind of business. Some came into it from their own smaller operations: small producers (some of them artisans) began employing more staff, mechanizing some processes, moving to larger spaces, and becoming manufacturers. This evolutionary model co-existed with instances where factory owners arrived ready-made from other parts of Canada, but more often, from the United States or the United Kingdom. Increased linkages across industries and systems also meant that capitalists and factory owners in one line of business regularly sought to close gaps in supply lines by means of vertical integration. These varied circumstances created distinctive conditions of work. For example, the two principal coal mining operations on Vancouver Island in the late 19th century were owned by the London-based and investor-driven Vancouver Coal Mining and Land Company (VCMLC) and the Dunsmuir family. The former sent out managers, sometimes recruiting support staff locally, and generally encouraged their workers to buy their own homes and to build community institutions. The latter was led by Scottish immigrants, Robert and Joan Dunsmuir, their son James, and a son-in-law. Robert had been a miner in Ayrshire, Scotland and James spent some of his youth learning the trade first-hand beneath Vancouver Island. 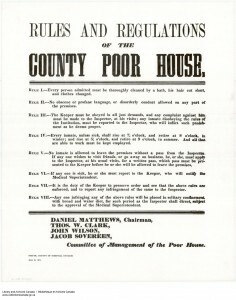 Their involvement in the miners’ lives was much more pervasive and included the use of company housing and stores (both as services and as weapons during disputes). The VCMLC operation had to generate dividends for shareholders, while the Dunsmuir mines were run with an eye to making money for the owners and their kin, and as such were far less arms-length operations. Figure 3.16 Their coalminers lived in shacks but the Dunsmuirs lived in style. James Dunsmuirs’s Hatley Castle near Victoria has, since his death, served as a military college and Royal Roads University, as well as the home of the X-Men in a series of movies. Coal mines and other resource-extraction industries in these years were a critical part of the pre-Great War economy. Providing fuel for steam power made coal important but it was also key to heating food and urban homes; cities and forest clearing had outstripped the ability of town people to find their own fuel. Likewise the food production industries of the late 19th century existed only because urbanites — the fastest growing demographic on the planet — could not address their own food supply. The grain economy boom of the turn of the century was part of this and so, too, was the growth of canneries. These appeared in fruit- and vegetable-growing regions but they were most impressive in the fisheries. What these resource-extraction industries had in common, then, was a growing market that was certain to continue growing and, in the years between 1867 and 1914, a need for large numbers of labourers. Craig Heron (York University) discusses the creation of workers’ communities and a working class. West Coast coal mines and canneries were sites of diversity, where Euro-Canadians worked alongside Chinese, Aboriginal, African-American, and Japanese labourers. These environments did not emerge by accident. Industrialization in Europe witnessed mass migrations off the land and into cities and the simultaneous conversion of peasant populations into urban industrial workers. This pattern could be seen in Scotland as farmers flooded into the factories and shipyards of Glasgow, and in Liverpool, which was awash with Irish immigrants performing all manner of labour. In Canada, there wasn’t much in the way of a peasantry to convert into industry; it had to be imported from elsewhere. In places like British Columbia, the choices came down to the proletarianization of Aboriginal people or the import of unskilled and mostly agricultural workers from Asia. If British Columbia had a more pastoral landscape and not a lot of mineral, timber, or fishery resources, then it is likely that the population would have been very differently composed. Figure 3.17 It would be difficult not to be simultaneously impressed by innovative machinery like this one and concerned about the displacement of labour that it entailed. 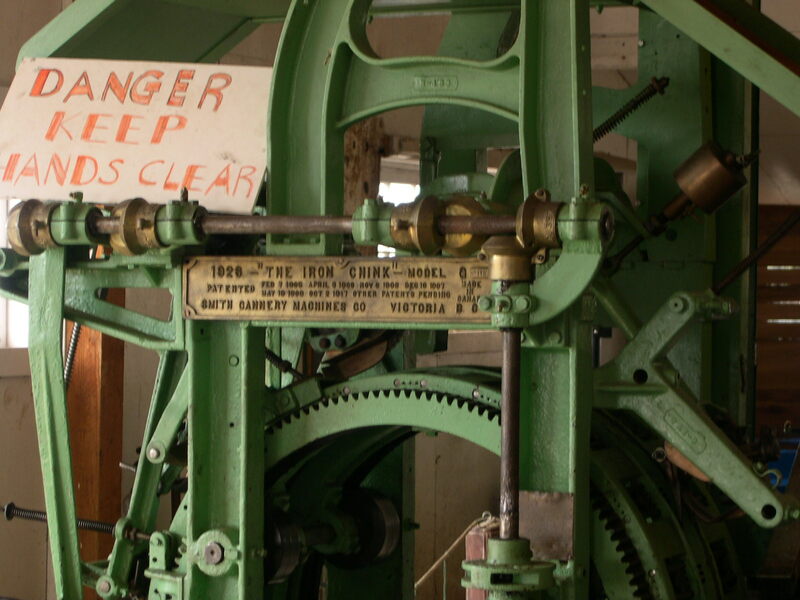 The “Iron Chink” revolutionized the salmon canning industry on the Pacific Northwest coast. Wages and conditions of work in factories, mines, and mills varied sharply according to race. Age was another factor. If the question was: Where do we find largely unskilled labour that will work under supervision in industrial conditions at rates that will profit employers? one answer was to find labour from a displaced or stressed peasant population. Another answer: from among the child population. Figure 3.18 Children contributed to the household income in a variety of ways, including coal gathering, which provided fuel to households and could be sold as well. A young girl in Toronto, ca. 1900. Efforts to define children’s dependence clashed sharply with the working-class family wage economy, whereby boys and girls began to labour for wages at a young age as a key survival strategy. For this reason, working-class parents were among the principal opponents of legislation aimed to restrict children’s employment. Some employers echoed these working-class qualms, principally because they saw child labour laws as a way of reducing profits by forcing the employers to hire more expensive adults. On the West Coast, restrictions on child labour chased the regulation of Asian labour and vice versa. The goal of a sufficient household wage among Euro-Canadian and Aboriginal workers could be undercut by adult Chinese and Japanese labourers, who were willing to work for about the same amount as boys. The racist context of debate on the issue of child labour was something of a distraction in that the English-speaking world was moving away from the use of children in industry. On the opposite coast, for example, and in the absence of a competing immigrant population, Nova Scotian collieries boys represented a falling share of an expanding workforce from 1866-1911, during which time their presence shrank from as much as 27% of the workforce underground (at Sydney Mines in 1886 and 1891) to as little as 5.5% in 1911 (at Springhill). The tide was turning against child labour. In some parts of the Dominion the employment of children of very tender years is still permitted. This injures the health, stunts the growth and prevents the proper education of such children, so that they cannot become healthy men and women or intelligent citizens. It is believed that the regular employment in mills, factories and mines of children less than 14 years of age should be strictly forbidden. Further, [we] think that young persons should not be required to work during the night at any time, nor before seven o’clock in the morning during the months of December, January, February and March. The darkest pages in the testimony … are those recording the beating and imprisonment of children employed in factories. Your Commissioners earnestly hope that these barbarous practices may be removed, and such treatment made a penal offence, so that Canadians may no longer rest under the reproach that the lash and the dungeon are accompaniments of manufacturing industry in the Dominion. Provincial restrictions on child labour — and on other aspects of workplace safety and laws — were only as good as the inspectors whose business it was to keep employers in line. In the British Columbia Ministry of Mines’ Annual Reports, for example, one finds one or two inspectors in the pre-1914 era attempting to cover an industry that extended from Vancouver Island to the Kootenays and into the Cariboo. Their arrival was always anticipated, so there was little chance of a surprise inspection. The reports issued by the inspectors, moreover, indicate a willingness on the part of mine owners and supervisors to comply with the law but whenever a disaster occurred — and mine explosions in Nanaimo claimed over 200 lives in 1887-1888 — the roll-call of the dead invariably revealed children well under the legal age. James R. Brown, a Toronto factory inspector testified to the Royal Commission on the Relations of Labor and Capital that his team had been set the task of inspecting Ontario’s factories and that the work was largely completed. Q. Did you find in many places where women were employed that they were working longer than the [1884 Ontario Factories Act] contemplates? A. Not in a great number of places. I found that principally in woolen [sic] mills. Q. What were the longest hours for which you found women employed? A. Sixty-six hours a week. Q. Did you find any opposition to shortening the hours? A. No; in each case where I found them working that time the employers stated that they were not aware the Act had been in force, and they were waiting for some formal intimation about the matter. Of course, they stated they would comply with the Act and reduce the hours of labour, so as not to exceed 60 hours. Q. Did you notice […] any large percentage of children? A. Yes; in some of them — in the cotton mills and some woolen mills, in cigar factories and knitting works, and some others. Q. Were there many of those children below the age designated by the Act? A. Well, I found about 40 girls under 14. Girls are not allowed under 14 nor boys under 12. I found six boys altogether nine years of age, and some ten or eleven. 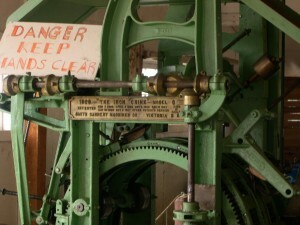 Long hours were only one source of complaint among factory workers. Punishments abounded and were often arbitrary. Testimony from a 14 year old journeyman cigar maker in Montreal in 1887-1889 revealed a regime of arbitrary beatings (“a crack across the head with the fist”) when a job was done poorly and the possibility of being imprisoned in the factory in a “black hole,” a windowless room in the factory cellar for upwards of 7 hours at time. Adults might escape beatings but not fines; dismissals were not uncommon. Moreover, involvement in a labour organization or a strike — particularly in a leadership capacity — could result in a worker’s name being added to a blacklist. Canada was large enough a country that a blacklisted worker might outrun this sanction, but sometimes the sanction followed them even into the United States. Civil suits were sometimes launched against labour activists and many labour leaders spent some time behind bars. In the 20th century, as the size and distribution of industries and corporations increased, managers came to rely heavily on intelligence gathered by industrial spies. Employers, at times, sympathized with some of the social goals of workers’ organizations, or unions, and began experimenting with what has come to be known as corporate welfarism. This is an array of services and benefits provided by the employer (but generally outside of a collective agreement). Employers did not, however, sympathize with the unions themselves and were often ruthless in disposing of the organizations and their supporters. Women were on the frontlines of industrialization and the creation of a working class. In 1901, 53% of all Canadian females were participating in the labour force, compared to 78.3% of all males. The labour of women was less visible than that of men in these years because of the persistence of cottage labour — or, in urban environments, “outwork.” Materials would be taken home by women workers and stitched together or in some other way refined so as to add value. This kind of labour (sometimes referred to as sweated labour) could easily be as gruelling as any factory work. Women were employed for both types of work in Toronto in 1868, when the Globe newspaper reported that some 4,000 women were either factory workers or they were engaged in outwork. Overall, the mechanization and systematization of work created more and more opportunities for women to engage in wage labour. The growing obsession of the 19th century state (federal and provincial) with surveying populations and businesses means that we have suggestive (if not comprehensive) information on the range of women’s experiences in the workforce. Women’s wages were typically a fraction of men’s, regardless of sector. The 1889 Royal Commission on the Relations of Labor and Capital reported that women’s wages in Ontario were about one-third those earned by men. The assumption that a patriarchal breadwinner brought home the bulk of the household wage was widespread and difficult to dislodge (and, indeed, persists in some quarters today). Women’s wages were thus trivialized as top-ups or “pin money.” As men’s wages lowered due to mechanization and increased competition for work that required fewer skills, the proportional contribution of women to the household economy became greater and greater. Children, too, were increasingly in demand in the industrial workforce, even sometimes taking jobs that had otherwise been the preserve of adult males. Figure 3.19 Poorhouses were disappearing but, in 1871, they were still a refuge for desperate Canadians and a source of some dread. The underside of the adaptive families of Victorian Canada is a history of husbands deserting wives, of brutality in which women and children suffered the presence and power of abusive men, and of males (and, occasionally, females) appropriating the paid and unpaid labour of their spouses and offspring as well as availing themselves of sexual access to those who, emotionally and physically, had few resources to resist. By the end of the century, something like one-in-every-eight wage earners was a woman. The “needle trades” were dominated by women, and textile towns saw industrialism effectively feminized. The systematization of cigar production allowed the penetration of what was once an adult male enclave by large numbers of boys, girls, and women. Women’s involvement in the labour force increased dramatically from 1891-1921. In an era when the population overall and the size of the labour force doubled, the number of gainfully employed women expanded even more rapidly. In the professions (which include teaching and nursing), the numbers leapt from fewer than 20,000 to nearly 93,000; clerical and sales workers exploded from 8,530 to just shy of 128,000. The category “operatives,” which mostly covers industrial workers, saw women’s involvement rise from 150,649 to 240,572. However, the number of women on farms was flat and, as a share of the population, that number was falling. The number of women listed as labourers fell from 1,049 to 441, but rebounded to 11,716 in 1931 — which suggests that the category’s definition was an issue. 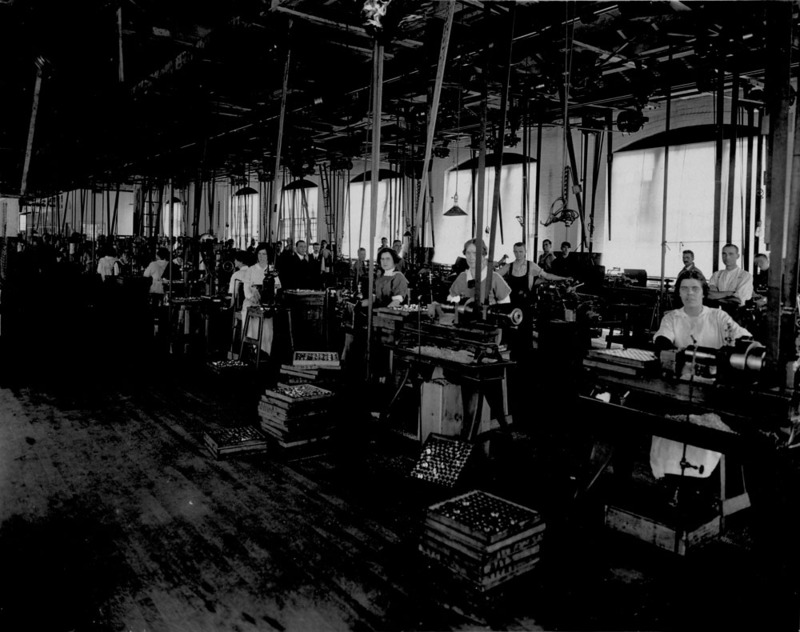 Figure 3.20 Mechanization and systematic organization of the workplace were defining features of deskilling in industrial settings. Women in war production at Canadian General Electric, Peterboro, ca. 1914-18. One distinctive aspect of women’s work lives was the influence of reproduction on labour. That is, the raising of families. While boys would rise through a process of apprenticeship through journeyman to adult worker and would continue on that rarely-broken path until they retired or died, girls and women entered and withdrew from the workforce more intermittently. Girls’ labour in the late 19th century was more heavily regulated (most provincial legislation kept them out of the workforce for two years longer than boys) and so they were more likely to get some formal education or take hidden work in domestic settings or outwork. If the household’s income improved, girls might be withdrawn from paid work in order to contribute more to the rearing of younger siblings — a strategy that would perhaps free up adult women in the household for wage-earning opportunities. Bettina Bradbury’s studies of women in industrializing Montreal show wives’ participation in the workforce proceeding through life cycle stages. The highest levels of participation are likely to come before the arrival of children, dipping with the arrival of infants and then dropping severely when the household contains children between one and 10 years of age. Participation rates recover and peak once again when at least one of the children passes the age of 11 years. [The Knights] deplored the capitalist degradation of honest womanhood that resulted from exploiting women at the workplace; many took great offence at the coarse language, shared water closets (toilets) and intimate physical proximities that came with virtually all factory labour in Victorian Canada. Nor did the Order turn a blind eye to domestic violence and the ways in which men could take advantage of women sexually. Local assembly courts could try and convict members of the Knights of Labor for wife-beating, and the Ontario Order was a strong backer of the eventually successful campaign to enact seduction legislation. What all of these studies reveal is that industrialism brought women and children along with men into the urban cauldron of change in the same era. Moreover, this constituted a perceived change in the long-standing rural and commercial way of doing things. Life courses changed, conditions of work were invented out of nothing, new anxieties replaced old, and there was — in this mesh of experiences — a realization that a new social class was emerging. Studies of the birth of working classes identify two aspects in particular: the shared experiences of belonging to a population dependent on wage-labour in an industrializing economy, and awareness of the same. Loyalties cut across societies and cultures in many directions, muting the possibility of working people seeing themselves as members of a common socioeconomic category or class. One measure of that emerging and evolving class consciousness is the incidence of labour disruption in the 19th century. The pre-Confederation era saw a rapid rise in labour disputes, accelerating in the 1860s. These principally involved small local associations of skilled craftsmen employed in factories. People of this generation could recall being independent craftsmen and transitioning into wage labour; now they were facing the mechanization of processes and a consequent devaluation of their hard-earned skills. These workers were generally literate and aware of political and international events. They recognized that their struggles echoed those occurring in Britain and the United States. Every strike, in this context, was like a flare sent up from a ship in distress. Inevitably, others would respond. By 1880, it is estimated that there were approximately 165 labour organizations in Canada, some of them local, many of them international. Virtually all of these were craft-based. As such, they perpetuated many of the associational rituals and practices from pre-industrial times. Marches, banners, oaths of loyalty, and the building of assembly halls were the most visible of these. Less obvious was the role that early unions played as social safety nets. Almost all had a “benevolent society” component to their work that involved life insurance for members’ families. The importance of this role could be seen when industrial accidents — most spectacularly in coal mining disasters — snuffed out lives a hundred at a time. Providing for widows and orphans was thus core to their mandate and an important part of building identification between labour and its community. Data source: Statistics Canada, Historical Statistics of Canada, 2nd ed., ed. F. H. Leacy (Ottawa: Statistics Canada, 1983): D86-106. Another development that confirmed the change in workers’ status since the mid-19th century was the rise of new management styles. Management generally became more widespread and dignified as a career in its own right. This was apparent in many environments, even underground, where new techniques for extracting (or winning) coal enabled greater supervision. The workforce as a whole was growing in the three decades before 1920 and in no category more so than in “owners and managers” (as can be seen in the table above). Starting at 78,639 in 1891, the total number grew to 84,040 in 1901, and 219,008 in 1911. The number of women in this category leapt from 3,036 in 1901 to 11,085 in 1911. Early in the 20th century attempts were made to rationalize systems of production that had lurched forward for 50 years without much thought given to systems. The most well-known body of thought on this subject is the scientific management model pioneered by the American Frederick Winslow Taylor (1856-1919). Sometimes referred to as Taylorism, these new approaches considered everything from the coordination of shift work, the positioning of machinery, and the inculcation of new industrial virtues like punctuality. Taylorism was part of a growing middle class agenda of social reform that included child labour legislation, universal education, and temperance or prohibition. While Canadians beyond the working-class acknowledged that excesses of exploitation needed to be curbed and that the most vulnerable needed to be protected, an interventionist state was still some decades away. And, of course, Canadian federalism meant that social legislation would arise at the provincial level, so it would be unevenly developed and potentially idiosyncratic. Middle-class engagement in these issues, however, could only go so far and reformism quickly ran up against emerging class-based antipathies. These tensions would explode in the first two decades of the 20th century. Industrialization produced a class of wage earners whose numbers grew rapidly in the 19th century. Working conditions in factories and mines were diverse but generally dangerous and unpleasant. Racial and gender categories divided and complicated the working-class experience. Children contributed to working-class household incomes, but were regularly abused in the workplace and were increasingly subjected to regulation by the state. Early labour organizations campaigned for improved working conditions for women and children as well as men. More complex systems and larger scales of production helped to produce a growing class of managers and supervisors. Port Essington by Unknown is in the public domain. 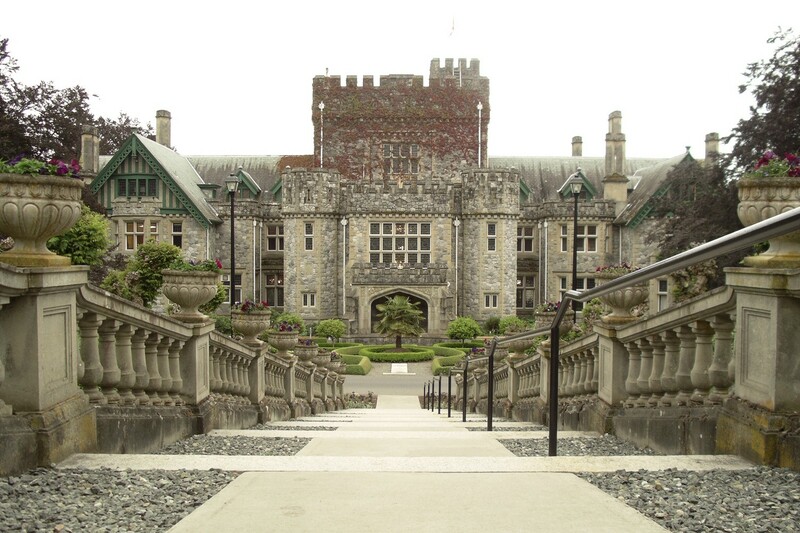 Hatley Castle by Smably is in the public domain. The Iron Chink by upyernoz is used under a CC BY 2.0 license. 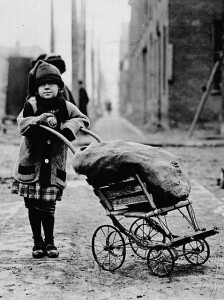 Young girl probably with bag of coal gathered from beside box cars (Online MIKAN no.3194020) by Library and Archives Canada / PA-118224 is in the public domain. 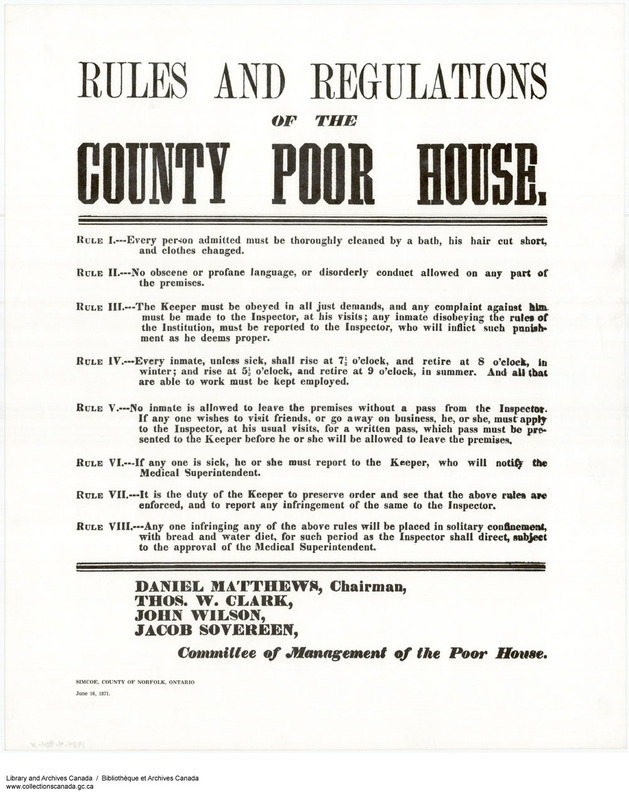 Rules and Regulations of the County Poor House (Online MIKAN no.2988345) by Library and Archives Canada, Acc. No. 1984-4-901 / Committee of Management of the Poor House has nil restrictions on use. 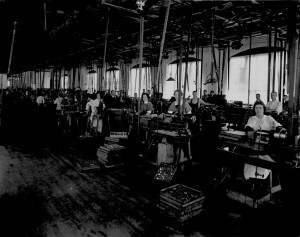 Women working on primers, [Canadian General Electric Co. Ltd., Peterboro, Ont. (Online MIKAN no.3371002) by Canada. Dept. of National Defence / Library and Archives Canada / PA-024490 is in the public domain. 3.4 Rise of a Working Class by John Douglas Belshaw is licensed under a Creative Commons Attribution 4.0 International License, except where otherwise noted.